There is a popular quote that reads, “Where words fail, music speaks.” Music is a powerful language. It can soothe, comfort and inspire. God has given us music for our enjoyment, but also as a tool of praise and worship. 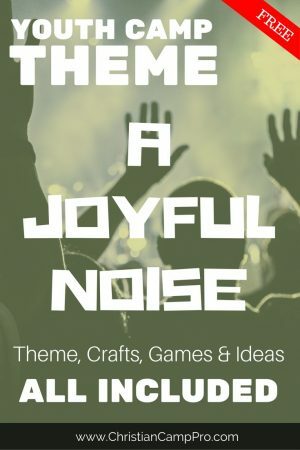 A Joyful Noise themed retreat can be a wonderful way to help children and teens explore the ways that music can be used to uplift one another and offer praise to God. 95 Oh come, let us sing to the Lord; let us make a joyful noise to the rock of our salvation! God commands us all to make a joyful noise. He doesn’t accept only the most beautiful singing or skillful playing. He delights in the joyful praise of His people. Use this scripture to encourage young people to praise joyfully, even if their playing and/or singing isn’t perfect. 5 Sing praises to the Lord with the lyre; with the lyre and the sound of melody! Everyone is expected to make music to praise God. Whether it’s through singing a song or playing an instrument, God wants our praise. This scripture is a great one to use to show young people that we are all expected to make music, but we can use anything to make music to God. The instrument doesn’t matter, just our joyful uplifted praise! Even though God doesn’t care which instrument we use and He doesn’t mind if our performance isn’t perfect, He still deserves our best. When we sing or play for Him, we should always prepare ahead of time in order to give our best performance. That means we have to practice! This scripture can be used to help your attendees understand the importance of practicing when it comes to worship. God doesn’t expect perfection, but He does deserve our best! These easy-to-make instruments are perfect to use as a demonstration of how any instrument can be used to offer praise to God. They are great as a creative outlet because each one will be unique. Supply empty paper towel or toilet paper rolls and plenty of colorful washi tape and let the imaginations run wild! This unique instrument is another fun way to explore music with young people. They are easy to customize both in look and sound. The instrument can be tuned to different tones by the arrangement of the bobby pins. Paint the boards fun colors and let your attendees compose songs of praise with a one-of-a-kind instrument. This is a great craft for older attendees. Simply supply inexpensive picture frames and let the young people chose printed paper or even sheet music to put in the frames. Finish the frame out with Scrabble tiles on the top. The glass of the picture frame becomes a handy dry erase board for writing down important notes! Everyone is familiar with the game Truth or Dare, but this version shakes things up a bit! Rather than having your attendees spill a juicy secret, if they choose Sing, they must sing a song of the group’s choosing. You can limit song choices to a certain category or genre, for example, you can make them sing Christmas songs or even Vacation Bible School songs. For this game, divide your group into teams. Play snippets of popular songs and allow each team to attempt to guess the name of the song. Only allow a few moments for the teams to answer in order to keep the game moving and to make it more challenging. The team with the most correct answer at the end of the game wins. This is a fun activity to use at the beginning of your retreat. As your attendees arrive, place a name sticker on their backs, making sure they cannot see it. The sticker should have the name of a popular musician on it. The attendees can only ask yes or no questions in order to try to guess who they are representing. This is a terrific icebreaker game since it encourages your guests to talk to one another. It’s just what it sounds like. Put on some popular tunes and let teams or individuals battle it out to see who is the lip-syncing champ! Using their voices and newly made instruments, let your guest make some joyful noise. They can jam to recorded music or rock out to own unique sound. Grab your gear and let the music flow! A Joyful Noise retreat can be a great way to teach young people about the importance of worshiping God through music. With this theme they can explore new ways to make music and be creative with their worship. They will also understand that worshiping through music doesn’t have to be perfect, just sincere and joyful. This post was made possible by our premium sponsor WOL CAMPS.